A loja italiana da GRAVITA ZERO estará fechada de 17 até 20 de Setembro porque Nanni e Max irão até à Alemanha visitar a "KANUMESSE" - o maior certame europeu de canoagem. De acordo com ambos, a GZ irá trazer as melhores novidades do mercado para disponibilizar a todos os seus clientes. Links mais em baixo! Sasa Rejec apresenta-nos mais uma pagaia da marca eslovena OPHION. A KATANA sai com duas versões. 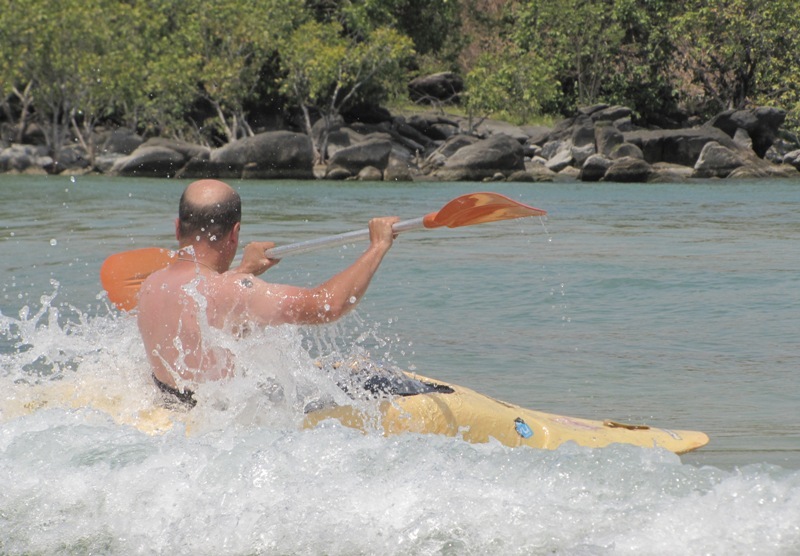 A mais barata - versão CLUB - é produzida especialmente para escolas de canoagem e empresas de aventura. São as primeiras fotos e, em breve, todas as novidades na página da OPHION! Esta mais barata sai a 166€. Mais em baixo, o vídeo mais recente de Darren Bason, Ophion Team. Sasa Rejec presents us the new OPHION padde - KATANA. This new toy was released in two versions. The less expensive is about 166€ (CLUB version) - this paddle was made specially for kayak schools and clubs with durable and flexible fiberglass. Check out this first photos and soon, all the infos on the OPHION website. Below you can also see the latest video od Darren Bason - OPHION Team. The new Ophion Katana slices through the water like a knife, it’s smooth, balanced, powerful and light. We wanted to compliment the already powerful aggressive existing range with something a little less aggressive giving the paddler a smoother more traditional stroke. The unique dihedral ridge on the powerface keeps the paddle stable while it slices through the water on a draw stroke. smooth paddle choose the new Ophion Katana. 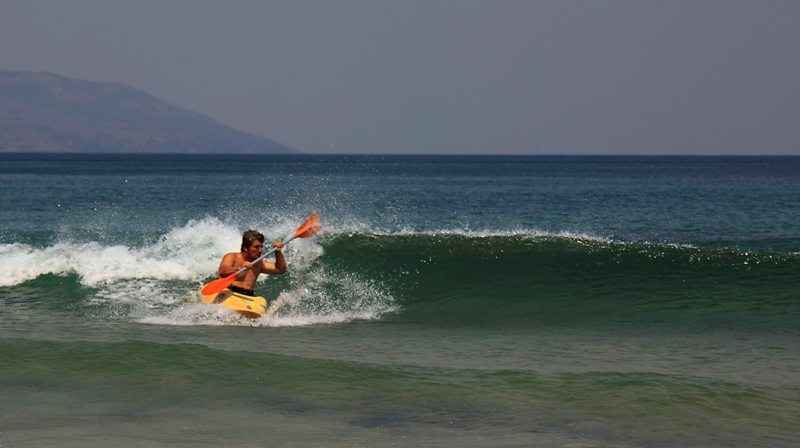 João Paulo Simões, NEWS TEAM kayaksurf.net e mentor da KFTP, envia-nos estas fotos que foram tiradas na margem moçambicana do lago Niassa. 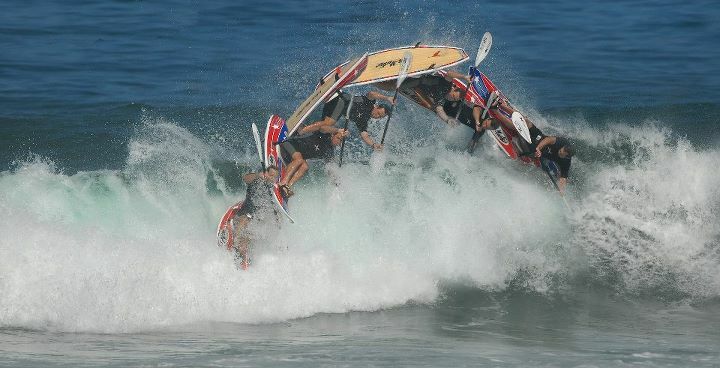 Na água, um playboat Riot e um swell pequenino, mas perfeito com água doce e cristalina a... 23 graus ;) Intervenientes: JP Simões, Paulo Calixto e Patson (formando da KftP em guia de canoagem turística). Como curiosidades, o João Paulo acrescenta-nos que o lago pode registar ondulação de um metro e é habitat de crocodilos. 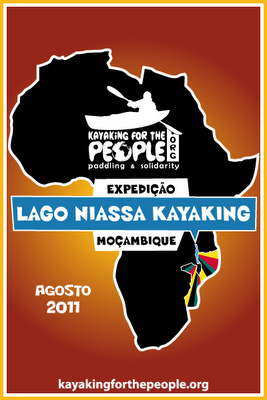 Esta pequena session teve lugar no âmbito da acção de formação da KftP para guias locais de canoagem de turismo, inserida no programa de ajuda ao desenvolvimento da KftP na província do Niassa, Moçambique (todas as infos em www.kayakingforthepeople.org). Depois das fotos, LINK para o site onde pode acompanhar toda a actividades da associação. 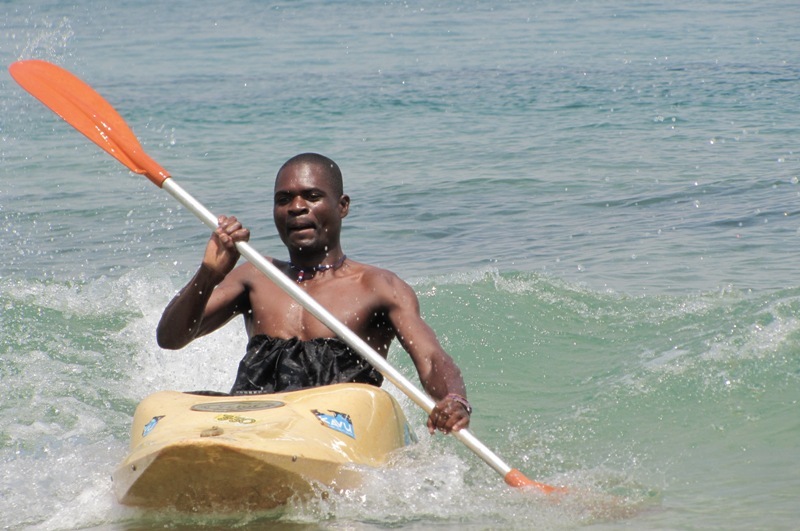 João Paulo Simões, NEWS TEAM kayaksurf.net and the mentor of the NGO Kayaking For The People, was in a mission last month in Mozambique. 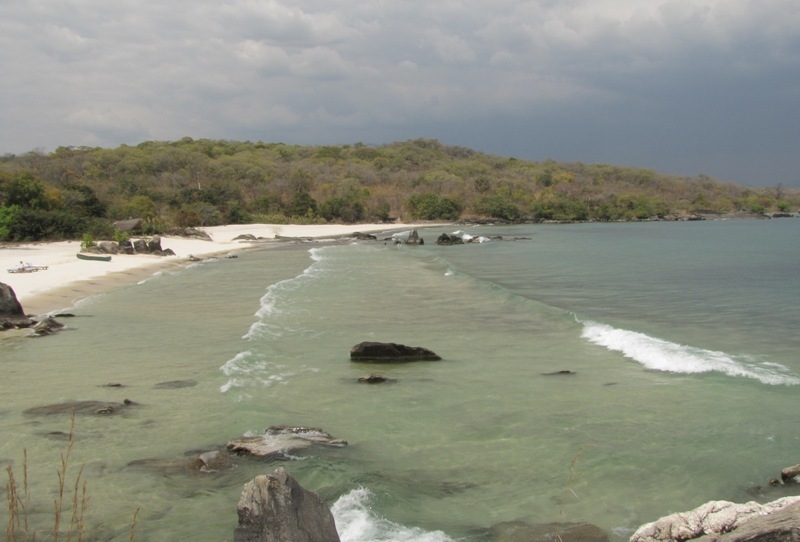 The Niassa Lake was part of this adventure and here, some photos with a tiny swell. 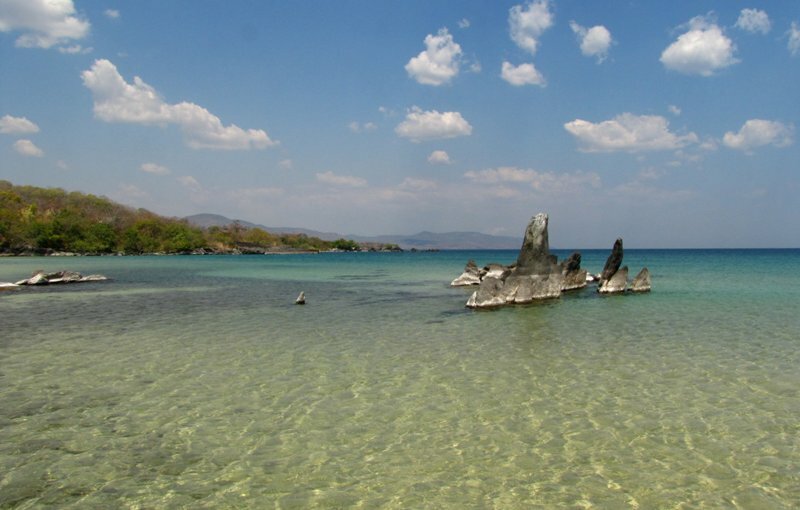 The temperature of the water... 23ºC! Very good. Check out the photos and then, you can visit KFTP site where you can follow all their activities. 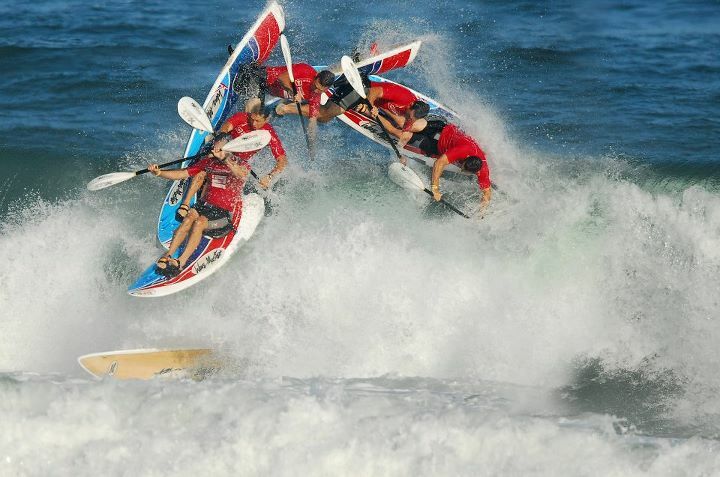 Nova entrevista com o actual campeão do mundo de kayaksurf e waveski (!!). 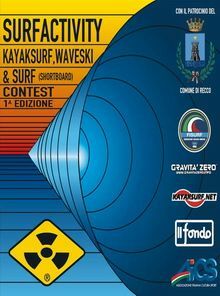 É o craque do momento que nos vai reportar todo o Mundial de Kayaksurf a decorrer nos EUA a partir do final deste mês. Clique em baixo e veja toda a entrevista! 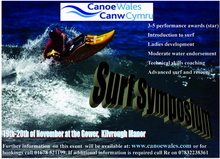 New interview with the current kayaksurf & waveski world champ (!!). 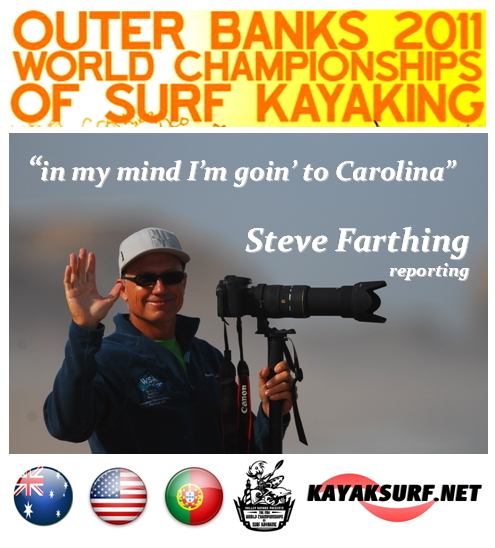 Steve Farthing will report for kayaksurf.net - like in Ocean Spirit Festival this year - all the Surfkayak Championship that will run in USA starting the end of this month. Click below and chek his NEW interview! Devido a furacão Irene, a prova e alojamentos serão mudados para Nags Head. 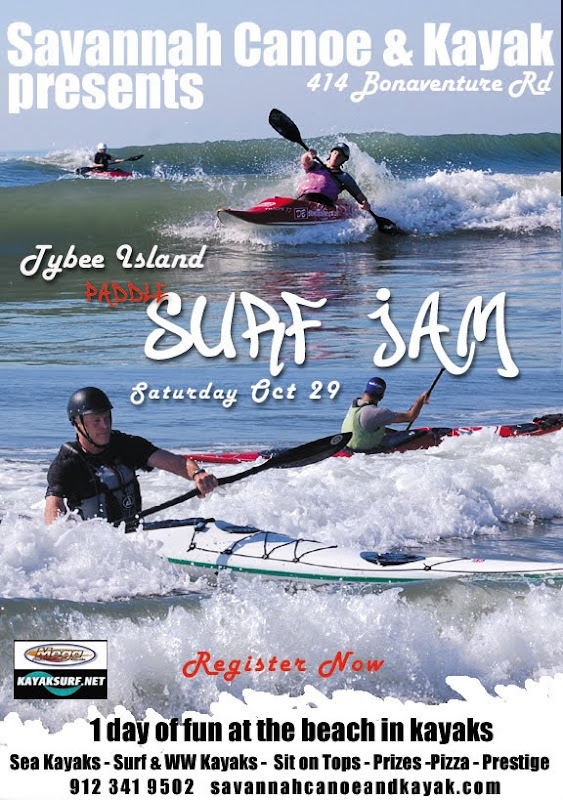 A organização solicita a todos os atletas que fizeram reserva para Hatteras Island, o favor se mudarem para Nags Head. Atenção que, primeiro, terão que contactar a organização pois eles têm todos os contactos necessários sobre esta alteração. 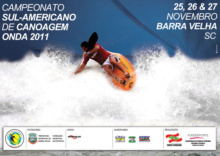 Mais em baixo o LINK para o site do Mundial de Kayaksurf com todas as infos necessárias. 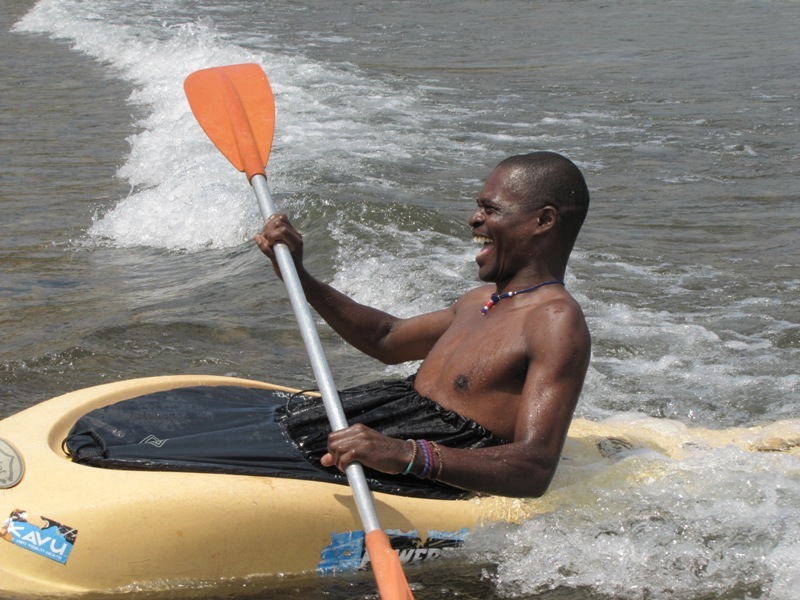 The Valley Kayaks World Championships of Surf Kayaking moved to Nags Head. It is vital that every competitor and non-competitor who has booked housing contact immediately the organization with the information they requested in the latest blog post of the official website. The organizing committee is working with realtors in Nags Head to secure a block of rental units of them same quality and price as units that participants had reserved on Hatteras Island. They expect to reach a final agreement on this housing within a day or two, so they are asking all atlhetes not to make commitments for new rental units before contacting them. PLEASE pass the word and visit the official website. Link BELOW. 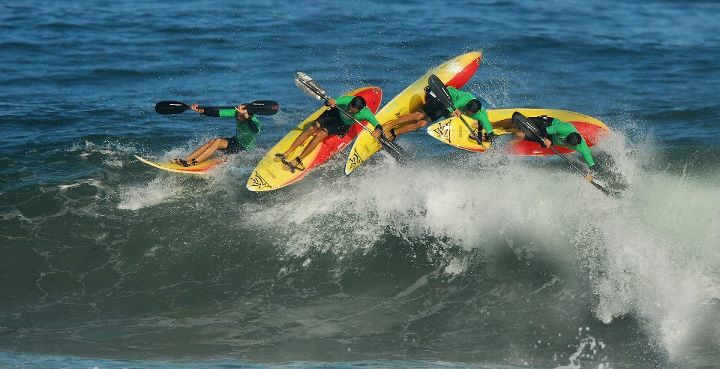 Galen Licht, o californiano que ganhou duas vezes seguidas o Santa Cruz Kayaksurf Festival, está de novo no kayaksurf.net. Clique em baixo e veja toda a entrevista! 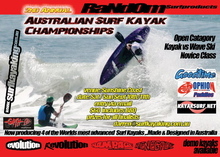 Galen Licht, the californian that won twice Santa Cruz Kayaksurf Festival in Steamer Lane, is again on kayaksurf.net. Click below and check his new interview! 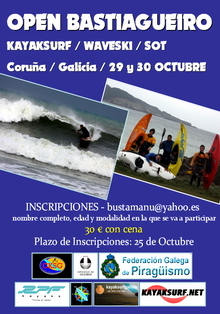 Oskar Martinez, NEWS TEAM kayaksurf.net, apresenta-nos os atletas que o País Basco terá a competir no Mundial de Kayaksurf a decorrer nos EUA no final deste mês. 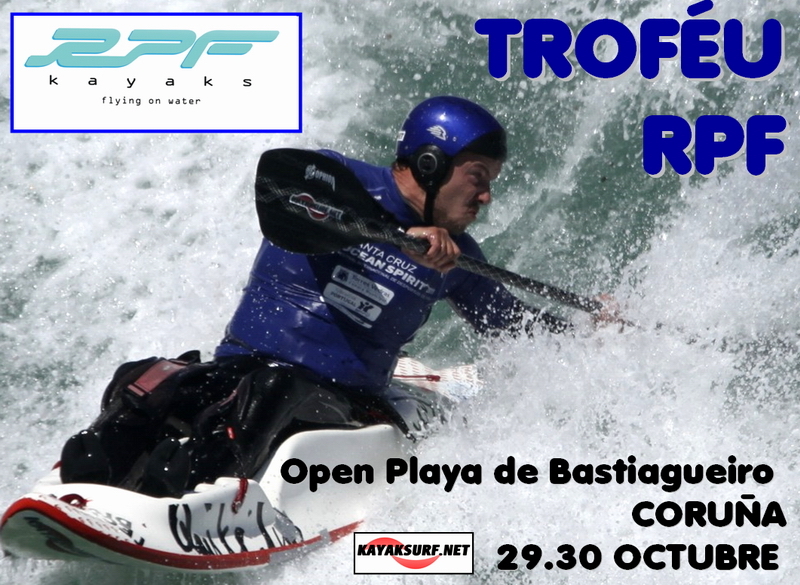 Partirão no dia 25 repartidos entre cinco categorias: Luis Abando, Txema Carreto(Grand Master e Masters), Ainhoa Tolosa, Garazi Iturralde (Women), Julen Arrizabalaga, Julen Seco (Juniors), Urko Otxoa, Xabi Olano, Ibon Agirrezabala, Edu Etxeberria e Oskar Martinez (Open). Boa sorte para todos!! 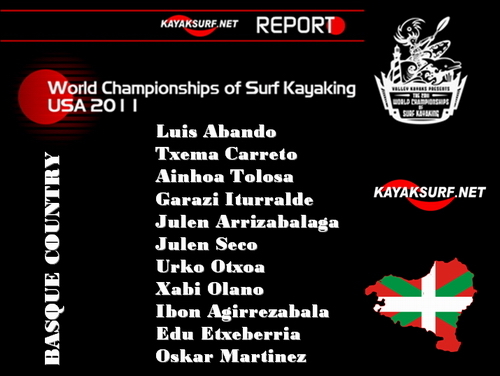 Oskar Martinez, NEWS TEAM kayaksurf.net, presents us the Basque Team that will be in the Surfkayak Worlds competing in five categories. 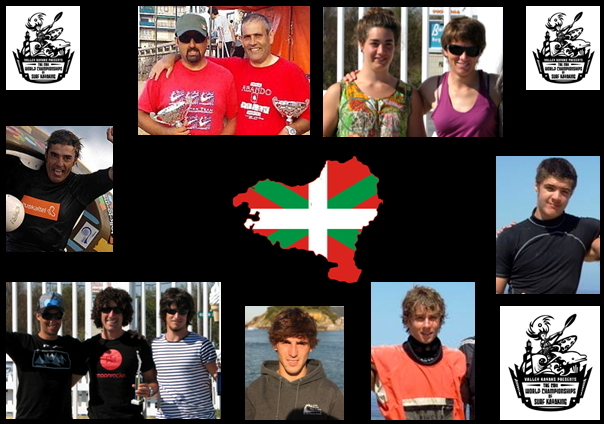 The athletes are: Luis Abando, Txema Carreto(Grand Master and Masters), Ainhoa Tolosa, Garazi Iturralde (Women), Julen Arrizabalaga, Julen Seco (Juniors), Urko Otxoa, Xabi Olano, Ibon Agirrezabala, Edu Etxeberria and Oskar Martinez (Open). Good luck for all!! 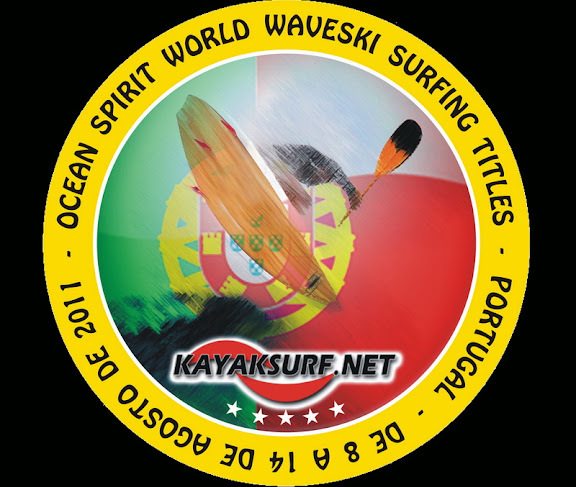 O site da Associação Mundial de Waveski já disponibilizou a listagem completa com as classificações de TODOS os atletas participantes. Mais em baixo, o LINK para a folha Excell onde constam todas as categorias e respectivas classificações. 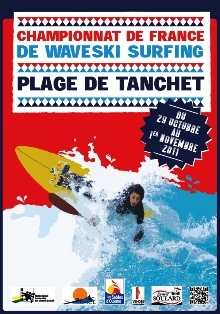 The World Waveski Surf Association has already online the FULL results spreasheet downloadable from WWST11. Just click in the link below and check all the categories and Full results. Pete Copp, NEWS TEAM kayaksurf.net, fez uma cobertura fotográfica de luxo no Mundial de Waveski 2011. Publicámos centenas de fotos suas juntamente com os reports de Steve Farthing. 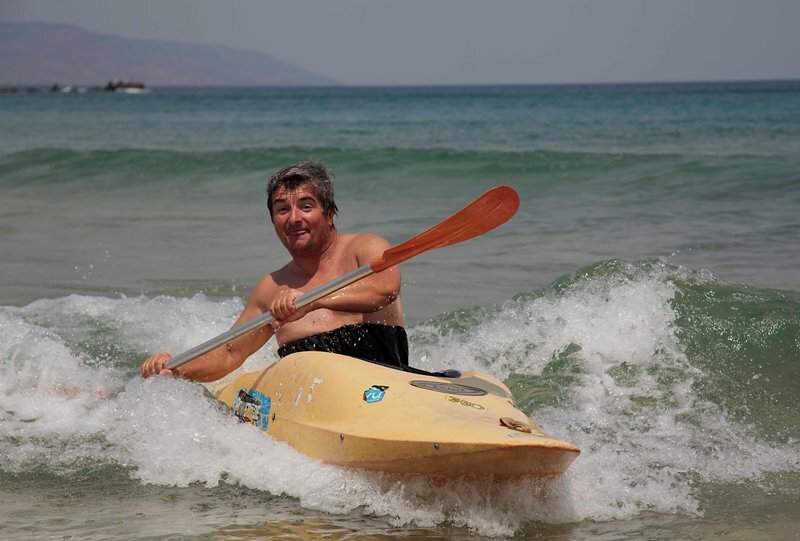 Agora, em jeito de recordação, Pete divertiu-se a fazer algumas montagens com fotos tiradas no Festival Ocean Spirit. Enjoy it! 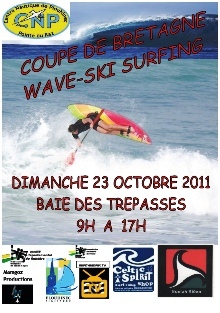 Pete Copp, NEWS TEAM kayaksurf.net, made an excellent photo coverage in the World Waveski Surfing Titles 2011. 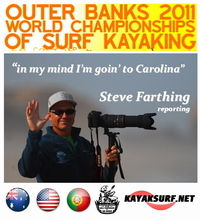 We published hundreds of his photos with Steve Farthing's reports. Now, just to keep Ocean Spirit in our minds, Pete made some fun assemblies with Photoshop. Enjoy it! !